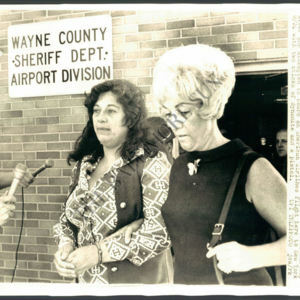 This is a 1971 photo of Downtown CORE member Barbara Pliskow (dark hair, in handcuffs). In the photo she has been arrested for trying to hijack an airplane at a Detroit airport. The action was done in order to free two members of the Black Panther Party (BPP) who had been arrested for separate crimes. Pliskow was originally from Michigan. She was a psychiatrist, according the New York Times, and working in a school before she joined Downtown CORE. Arrested at the Rutgers Houses demonstration during the summer of 1963 city wide campaign against the construction industry. She spent 5 days in jail at the women’s House of Detention. She was 29 at the time. The case was taken all the way to the Supreme Court but was refused. On Sept. 24, 1971, Pliskow, in her attempt to escape arrest after her attempt to hijack the plane was discovered, threw dynamite at the officers and pulled a gun while screaming ‘We’ll all die!”. A note in her hand bag indicated her plan was to threaten to blow the plane up unless two specific members of the BPP were freed from a local jail. The action was taken on behalf of the Black Liberation Army, the underground military aspect of the BPP. Pliskow was identified in news reports as a member of the White Panther Party, a support group for the Black Panthers made up of White members. It was also reported she had previously worked as psychology instructor at Wayne State University and the daughter of a well known criminal attorney in Detroit. “photo of Barbara Pliskow, Downtown CORE,” corenyc.org, accessed April 21, 2019, http://www.corenyc.org/omeka/items/show/245.